Most everyone is familiar with the requirement to move right and stop for approaching emergency vehicles using lights and/or sirens. 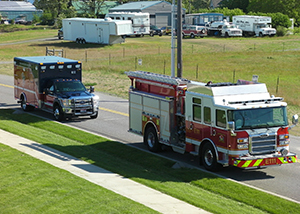 Do you know what to do when approaching an emergency vehicle, tow truck, or other roadside assistance vehicle stopped and using lights/sirens? Washington law requires drivers approaching these “emergency zones” to slow down, and if possible, move away from the emergency vehicle. On an interstate or highway with more than four total lanes, this typically requires leaving one lane between yourself and the emergency zone. Upon the immediate approach of an authorized emergency vehicle making use of audible and visual signals meeting the requirements of RCW 46.37.190, or of a police vehicle properly and lawfully making use of an audible signal only the driver of every other vehicle shall yield the right-of-way and shall immediately drive to a position parallel to, and as close as possible to, the right-hand edge or curb of the roadway clear of any intersection and shall stop and remain in such position until the authorized emergency vehicle has passed, except when otherwise directed by a police officer. RCW 46.61.212: Approaching emergency zones—Penalty—Violation. If changing lanes or moving away would be unreasonable or unsafe, proceed with due caution and reduce the speed of the vehicle. A person may not drive a vehicle in an emergency zone at a speed greater than the posted speed limit. A person found to be in violation of this section, or any infraction relating to speed restrictions in an emergency zone, must be assessed a monetary penalty equal to twice the penalty assessed under RCW 46.63.110. This penalty may not be waived, reduced, or suspended. A person who drives a vehicle in an emergency zone in such a manner as to endanger or be likely to endanger any emergency zone worker or property is guilty of reckless endangerment of emergency zone workers. A violation of this subsection is a gross misdemeanor punishable under chapter 9A.20 RCW. The department shall suspend for sixty days the driver’s license, permit to drive, or nonresident driving privilege of a person convicted of reckless endangerment of emergency zone workers. Confusion and merging traffic around emergency vehicles and emergency zones can quickly lead to car accidents. If you are injured in an accident, you need an experienced and knowledgeable personal injury lawyer in Spokane on your side. The attorneys at Parke Gordon Law Firm will work hard to get you the compensation you deserve. Contact the law office of personal injury attorney Mat Parke today for a free consultation. This is your opportunity to speak with an experienced personal injury attorney about your case for free. Call (509)482-7274 to get started on receiving a fair settlement from your personal injury case.